Six In The Country: My first blog award! My dear friend Nessa bestowed this award on me a few days ago. I am so very flattered! 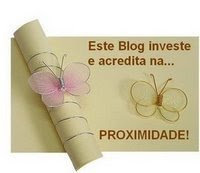 According to Nessa: The words are in Portuguese and mean, “This blog invests and believes, the proximity” (meaning, that blogging makes us ‘close’ -being close through proxy). I have learned so much from all of you, my bloggy friends -- those who entertain, inspire and educate me.